March 21, 2012 September 24, 2013 / Julie Brook, Esq. You’ve taken on a car accident case. Who’s going to be your best witness? Many times it will be the officer who arrived at the scene. But how do you evaluate whether that officer will really be a good witness for your client? 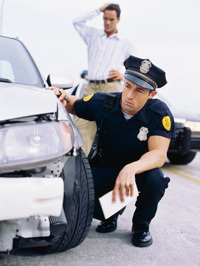 California Highway Patrol and local police officers routinely investigate motor vehicle accidents. The investigating officer usually arrives on the scene promptly and observes physical facts, such as the position of vehicles, location of skid marks, and condition of the parties, as they exist immediately after the accident. The officer interviews witnesses while events are fresh in their minds and before they have formulated exculpatory stories. He or she is generally a trained observer, and the findings recorded in the accident report are contemporaneous and comprehensive. By the time a case comes to trial, the investigating officer usually can’t testify about his or her investigation on the basis of present, unassisted memory. But by using the accident report to refresh his or her memory or as a past recollection recorded, the officer is able to testify on a broad range of subjects relating to the investigation. their effectiveness as a witness. These interviews will help you figure out the extent to which the officers’ testimony will be favorable, so that you can decide whether to call the officers as witnesses or to prepare to cross-examine them if called by an adversary. Investigating officers usually make good witnesses because they don’t normally volunteer, qualify answers, or evade. When a question calls for a “Yes” or “No” answer, an officer replies accordingly. As an added bonus, officers usually appear in uniform, giving an authoritative presentation. But even the most experienced and articulate officer can be ineffective if he or she didn’t get to the scene until long after the accident, or cannot distinguish it from the many others he or she has investigated, particularly if the case isn’t brought to trial for a long time. An individual officer may not have sufficient training, experience, skill, or interest to observe and record accurately and thoroughly. Occasionally, the officer may be a biased or pugnacious witness, or with a manner that is flippant, halting, monotonous, or otherwise ineffective. Some officers are simply not good investigators; some are not good witnesses; and some are neither. Will the officer’s testimony about the facts be favorable or unfavorable? Is the officer articulate, confident, unlikely to be shaken on cross-examination? Does the officer limit his answer to the question asked? Does the officer appear to know what he or she is talking about? Does the officer appear bored or resentful for being drawn into the lawsuit? Does the officer have any prejudices against plaintiff, defendant, or their lawyers? Does the officer know or has had business dealings with any of the parties, witnesses, or opposing counsel? Has the officer made any value judgments about the parties, the witnesses, or any phase of liability (e.g., speed, inattention, intoxication)? How well qualified is the officer to make the judgments made? Can the officer be qualified and should he or she be called to testify as an expert? If so, on what subjects? For everything you need to know about handling witnesses in personal injury cases, turn to CEB’s California Personal Injury Proof Book, chap 4. On the car accident reconstruction process, check out CEB’s program Automotive Accident Reconstruction: A Primer for Attorneys, available On Demand.